I've looked at some of the text online for the CCB and it looks pretty decent. The notes look more faithful than the NAB. But I seem to remember there are some oddly anti-Catholic book introductions. I remember reading something like "The Church used to be bad and do things like..." or something to that effect. I wonder if anyone has encountered this? Great job! You really hit the nail on the head in describing this version. 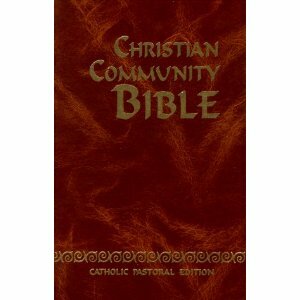 As noted in previous post, I have been using CCB:CPE since 2003 and its my preferred (but not exclusive)daily Bible. I have to check to be sure (don't have it with me) but I think my edition does have a lectionary reading guide. Matt: just going from memory I can recall places in the notes where the human failings of Church leadership or membership are referred to, but then...that's the truth. Church history clearly shows times when "the Church was bad" meaning its earthly leaders and members. But it's not one-sided. I also recall many referrals to saints and the good works of the Church. I also like the rendering in Luke 1:28: "Rejoice, full of Grace". Good luck finding a CCB:CPE at a decent price. Their website is in the Phillipines and/or Macao *I believe)and those are the best prices. BUT what I have found is to locate a parish or shrine staffed by the Claretian Fathers (they sponsor this version it seems) and they always have CCB:CPEs ate great prices. Often the OLD prices from when they first stocked the Bibles. Anyone living in southern CA - go to San Gabriel Mission Bookshop they were having a discount special on a few CCBs there last month. I gave this bible away because the notes are blasphemous and heretical in places. In Genesis chapter 12, I believe, and in some of the Psalms, the notes refer to God as "she" and "her", in places. I called the publisher to see if this was some kind of error and I was told this was done intentionally, it was not a mistake. Do yourself a favor and get rid of it. I have found the notes a bit suspect, like part of the note on James 5:13 -"The Elders are those in charge of Christian communities. They were lay people but had been charged with the direction of the community, the celebration of Baptism, Presiding at the Eucharist..."
That seems to suggest that lay people could preside at Mass in the early Church. Study Bible ready to ship in a few days and is the NABRE finally done? As for the study Bible from Saint Benedict Press, I don't have a precise date yet by it should be any day. Keep checking their website. I don't think it says anything quite that negative, though I do recall discussions (as Diakonos said) about historical events. I don't think I've read anything I'd consider Anti-Catholic, however. I'm not sure where the notes say things like that, but you are correct that the CCB discusses God in feminine terms towards the end of the Old Testament. I think in Proverbs there are verses about "Holy Wisdom", which is discussed in feminine terms. Moreover there is the "Shekhinah", which doesn't appear in the Bible but which gets mentioned in the notes. I'd have to check, but I think that Isaiah also writes about God in feminine terms occasionally. This does not mean that the CCB is saying that God is a woman, however. Yes, I was slightly bothered by that as well. Romans also ends with mention of a deaconess, without any explanation in the notes. In my edition (34th, c. 2003) there is indeed a very nice "Biblical Readings in the Mass" section at the endof the Bible (pp. 537-548)which begins with a pie chart of the litrugical year, has a table of moveable liturgical days, and then gives the citations for Sunday AND Daily Mass readings. There is reference in notes to the femminine side of God (so to speak) but never saying God is a woman. The notes can be a mixed bag here or there yet still much better (IMHO) than most of the NAB and most of the time they far outstrip the NAB and NJB in their Catholicity. Notes on Marian and Petrine passges are pretty thorough and good. Interestingly the definition for ELDERS in the "Brief Lexicon" in the back of the Bible gives a solid definition of Elders and nothing like what is mentioned in James 5:16. Check the notes in ch. 12 of Genisis I believe, since I no longer have this Bible, and see if the notes do not refer to God as "she". Again, I called the publisher about this and he made no attempt to deny this and said it was not a mistake. This edition was probably about 2005 or 2006. Also, in Psalms some of the notes refer to God in the feminine, not Wisdom personified. "God is testing us, he knocks on our hearts to see what the echo will be: will we be able to let go of our own wisdom and enter into his plan?" I don't have the version you did, but mine doesn't have what you're discussing. Diakonos: does your copy use feminine terms for God for Chapter 12? Am at work and don;t have the CCB with me...will check and get back to you. BTW if in the notes (which are an editor's or scholar's fallible contribution no matter what version or edition of the Bible) God is a times referred to as she, I don't see the problem. We know that the Trinity is neither male nor female and that only the incarnate Word is male in his humanity. If the Scriptures at times describe God and divine actions/attitubutes as feminine, can't an editor or scholar do so as well? If you like it go for it. I prefer more traditional renderings for God. Our Lord calls God His Father, not mother. It is God the Father, God the Son, and God the Holy Ghost or Holy Spirit in Catholic Tradition. It seems a dangerous and questionable trend to render otherwise. Your edition must be an older one. I fear it is a good old fashioned case of PC at work there. Let every man be convinced in his own mind. Check the online version. In the section entitlrd "The Three Sayings of God", before ch. 12, it explicitly refers to God as "she". This is in the Book of Genisis. You can suit yourself, but as an orthodox(small o) Catholic I have no use for this. Fifty years ago this would not have been acceptable, but nowadays about anything goes. I just want people who may buy this Bible to be fully informed. Then let them decide. P.S. The heading before Psalm 6 refers to the Psalmist as "she",. While not on the same level as refering to God as "she", I still think this to be a very novel perspective. I do not ever remember the proposition advanced that any of the proposed Psalmists were female. While this may not be completely verifiable one way or another, I do believe it bespeaks a discernable slant in the translation. I believe it is the better part of valor to shun anything that smacks of heterodoxy. I don't know. Non-traditional things like that give me goosebumps. What's wrong with "He"? You are correct. I have to retract my statement earlier, since that section does talk about God as if He were a she. It's seems to be written in quite a different voice from the rest of the commentary in the CCB, which is likely why I didn't remember reading it. It is a good idea to get as much information out in the open as possible. I still like the CCB, and I would recommend it to others. I'll just have to add this to my list of issues I have with it. Francesco: Nothing wrong with "He" and I prefer it. But God is Spirit and when using human experiences to describe his action and interaction with us sometimes the feminine is more appropriate. Using these kind of analogies doesn't genderize God. He is far above that. When you think about it even 'Father' is an analogy as is 'Son'. For to us this Father/Son relationship means there has been a conception of one from the other, and thus the Father is greater than the Son in pre-existence. Yet we KNOW that's not true but we still continue to use 'Father' for its many other meanings in relation to the Trinity. I can't think of the source(s) know but I seem to recall some mystics or theologians of sound doctrine speaking of the Holy Spirit in more feminine terms and analogies. I also agree with your insight into the CCB notes. I sometimes get the idea that different books had commentary written by very different people (as is common in many Stusy Bibles). I also agree that I still prefer the CCB:CPE and even with all this in mind I still find the docrtinal notes to be more Catholic and faithful than the NAB and NJB. I think only the Ignatius Study Bible has more Catholic-friendly notes. Francesco: I did nto see any reference to God in the feminine in Gen 12, but I did read it at the end of a very long day. Dave: I did see one reference to God in one sentence out of the 2 page/13 paragraph long "Three Sayings of God". But the context of it makes me think that the author is attmepting to relate God's Self and Action to all humans and in this context I see nothing problematic. In this same essay the author constantly refers to God as "he" and even at least once as "Father". So I think we have to look at the whole and take things in context. If we hold that an orthodox Catholc may never ever refer to God's Self or Action in a feminine light or as an analogy of feminine attributes then I think we need to go beack through some of the great spiritual writers of Christianity and rethink the soundness of their doctrine. The plot thickens! I checked my copy at home and the two instances of feminine references (in the "Three Sayings" essay and in the prologue to Psalm 6) are not present. There must have been some evolution in the notes in the decade between when I received my copy and when you did. the "Three Sayings" essay says that creation was God's way of expressing "himself" (not Godself) and that "God calls whom he wants and gives to one person what he does not give to another." The online text uses feminine pronouns in that sentence. Psalm 6 says that it's "the prayer of a sick person. When he asks to be freed of his sickness he reaffirms his unshaken trust and his will to have nothing to do with evil." Again, the 17th edition uses masculine pronouns where later editions use feminine ones. This raises a few interesting questions! I wonder how else my edition of the CCB is different from the ones you had? Also, how significant do editorial changes have to be before they affect the validity of an imprimatur? I know that the changes to the RSV-CE to create the RSV-2CE were not deemed great enough to merit a new imprimatur, so there has to be some wiggle room. Still, I think this is materially different from changing "cup" to "chalice". If you would like me to look up any other passages I'll do so. Well, the plot does thicken. I was wondering that exact thing myself (evolution of notes) as I was searching the text. When I get home I will check and see what date for imprimatur is on my 2003 edition. Sharon: I would guess a change in publisher could affect the notes because the Claretians (who publish the CCB) are well known as a more progressive or liberal group, at least here in the USA. They publish "U.S. Catholic" magazine which I wouldn't even use to line my bird cage. However, I do know that the theological bent of an international religious congregation like the Claretians can and does differ among their provinces. For example, the U.S. province of the Daughters of St. Paul (publishers, too) has been known as the more traditional segment of the community. They were still in trad habits while their Canadian sisters were in secular clothing and selling more liberal theological works in their stores. But the US Daughters "evolved" too and while still in (modernized semi-secular looking) habits here in CA they often sponsor speakers who are questionable. I have the 9th ed (2000) Tagalog Version of the CCB-CPE. The notes for the Psalm 6 and the "The 3 Sayings of God" essay in Genesis is not an issue. English: "When (she) asks to be freed of (her) sickness ..."
Tagalog: "Sa paghiling (niyang) lumaya (siya) sa kanyang Karamdaman ..."
English: "God calls whom (she) wants ..."
Tagalog: "Tinatawag ng Diyos and sinumang mapusuan (niya) ..."
niya\siya - is gender less. I guess Tagalog handles inclusive language a little different than english. Anonymous: this raises another thing I forgot to mention. I have often had the idea that perhaps the translation of the text is the problem into English. Or if the translator is perhaps someone for whom English is not the primary language. Thanks for the comparison to the Tagalog! Each language's grammar is different, and they can make things that are clear in one language ambiguous in another. I'm reminded of a story I read in a book by James Baker (US Secretary of State from 1989-1993) that negotiations with the Russia and Germany where about to collapse because of some pronouns in the English version of an agreement, but that everything was papered over because the Russian language didn't have those pronouns! I don't think that's what happened. The older editions (for instance, my 17th) used "he" and "himself", while the newer editions use "she" and "Godself". The translation into English already happened, but then the translation was revised. Like most people in this blog I have several english translations of the bible. The CCB-CPE intrigued me because of the notes as mentioned in the review. But, do I really need another english translation. I already have a dynamic-equivalence bible. Fortunately, I can read Tagalog so I bought the Tagalog version of the CCB-CPE. I'm gald to know that the Tagalog version may have been spared the problems of the more recent editions of the English CCB-CPE. I ordered the CCB after reading this review from the Amazon link posted above. The CCB that I received is NOT burgundy in color but is instead dark green. It also says "1st Edition" on the title page and the copyright is from 1998. This was purchased brand new from Amazon and not a marketplace seller. Timothy - it is very interesting but it reflects the CCB IMHO. It is a mixed bag. So many of the notes and articles are so spot-on and then there are the lesser-than components. But even with these in mind it remains a favorite of mine and I always find inspiration for Christian living in its pages. I think if we gave the NAB or the NOAB or the NISB the scrutiny we have given the CCB we would come up with various unacceptable notes and theologies here-and-there in those versions/editions as well. Hi, I have the "Biblia Latinoamericana", (Latin American Bible) in early 80's this traduction was revised because his particular point of view about the social equality. The argentinian bishops says this bible recognize the "Teología de la Liberación" (Liberation's Tehology). In other order, the language in this traduction it's easy and friendly. The CCB was first published in the 80’s; bearing the Imprimatur of Cirilo R. Almario Jr. and a Nihil Obstat by Efren Rivera OP (latter editions simply carry the Imprimatur of the CBCP). With every edition, there are changes to the notes or text or to the additional materials included (eg. pictures, lectionary, lexicon, etc.). The earlier editions (such as the 8th edition) don’t have inclusive language while the latter (such as the 17th) has. One can look at Psalm 1 where the earlier has "Blessed is the man" while the latter has "...the one". Another obvious difference is at the introduction to the gospels where the earlier ones includes a section about the 'Q' source while this is completely absent from the latter ones. Also check the commentaries for the first 3 chapters of Genesis as there are notable changes. From my observation (as I have both), the notes of earlier editions has a tinge of liberation theology while the latter has feminist influence. The changes or additions to the notes or text are a mixed bag; some are improvements while others are definitely not, from an orthodox standpoint. This is a far better version than the NAB. If you are thinking of purchasing one, try getting one of the earlier editions if possible. Just checked the 2013 update at http://ccbpastoralbible.wordpress.com/ and it looks like the female pronouns were taken out of the "Three Words of God" Section, though "Godself" is still there. just as an update. Blessed day. While reading your commentary on Matthew 9:38 in the bible, you state that Mary " ... is the finest symbol ... " (1403, "Christian Community Bible") of the " joyful and humble way of believing and doing the will of the Father" (1403, "Christian Community Bible"). Isn't Jesus the finest example of this? Good day. While reading the commentary on Exodus 20, and more specifically Exodus 20:4; I came across the statement on page " ... we serve Mary by being an imitation of Christ". However according to the KJV "Thou shall worship the lord they God, and him only shall thou serve", not Mary. In addition, the commentary goes on to say "We do not expect from her anything but what the father himself decides to give us through her mediation". On the contrary scripture (KJV) says in Hebrews 9:15 that Jesus Christ " ... is the mediator of the new testament ... ". Your disagreements with statements in CCB about Mary and your reliance on the KJV translation indicate that you may not be Catholic. Welcome! Grace and peace to you! It's generally considered bad form to necro a thread that's been dead for years and was started close to a decade ago. Thread-jacking (e.g. trying to turn a review about a Catholic bible into a debate about Marian beliefs) is also not the best thing to do online. Perhaps you might find the answers you're looking for elsewhere?